IT'S 9:30AM and the queue outside the supermarket stretches at least 30 metres. Hundreds of adults - and comparatively few kids - are lining up for groceries. But this isn't 1940s Warsaw and these people aren't here for real food. 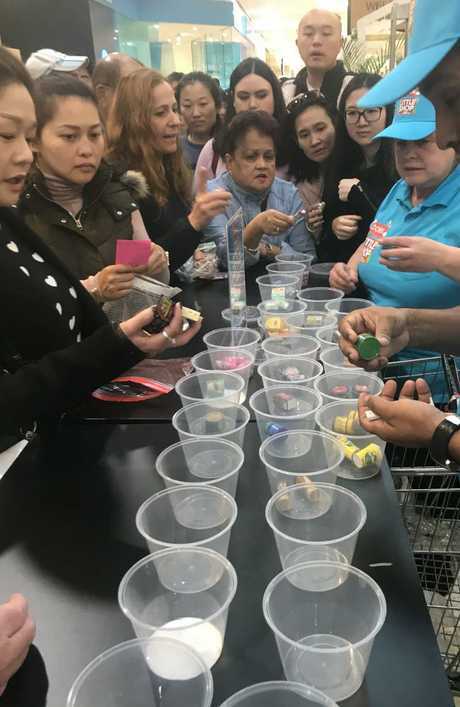 This is Coles Burwood in Sydney's west on a Saturday and everyone's here to trade tiny plastic replicas of everyday supermarket items. 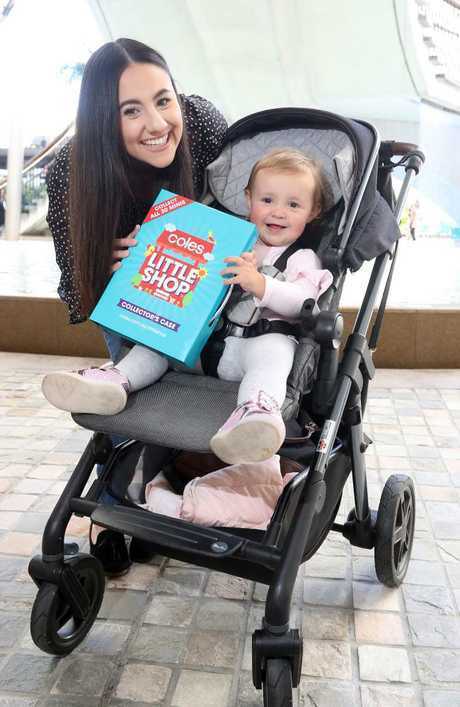 Welcome to the extraordinary world of The Coles Little Shop Swap Day. 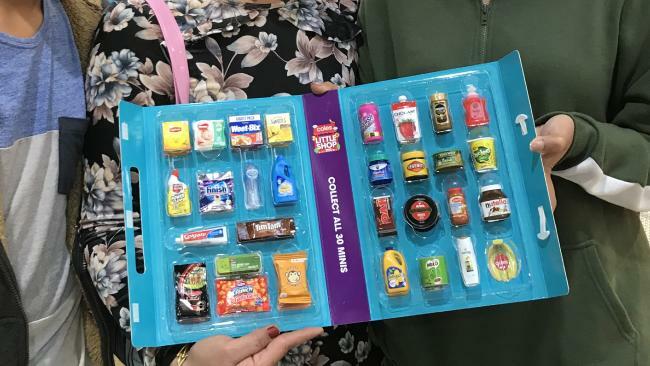 The items being swapped are known as Little Shop Minis which - for those of you who only buy actual groceries rather than pretend ones - are a promotional stunt run by supermarket giant Coles. 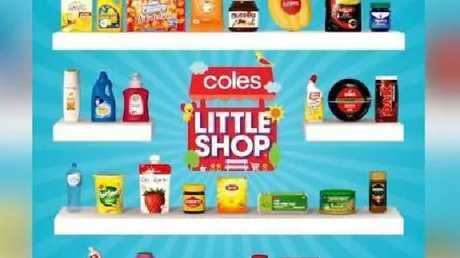 The Coles Little Swap items. For every $30 spent, customers are given one mini replica grocery item - they range from tiny jars of Nutella to micro tubs of Vicks VapoRub. There are 30 to collect. 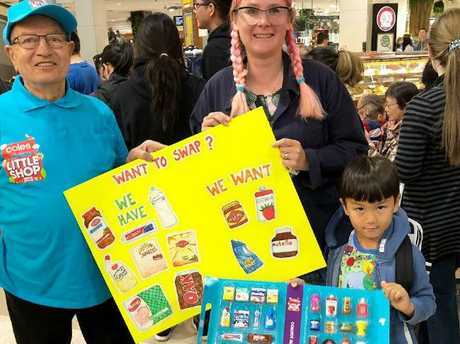 To help its customers reach the lofty goal of a full set, Coles is throwing a swap meet at selected stores around the country today. Store reps are armed with tubs of tiny Weet-Bix and Chobani yoghurts and customers are allowed to swap one-for-one. Or at least that's the idea. 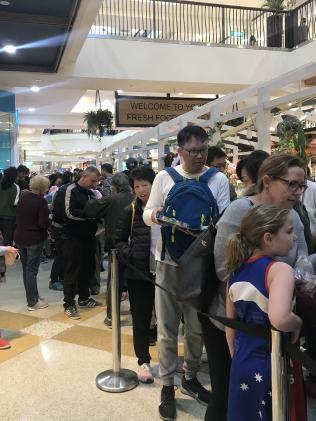 But with 30 minutes to go until the official starting time, the crowds here at Coles Burwood are taking matters into their own hands. Clusters of rogue collectors are bypassing the store's official counter and performing black market swaps with each other in the queue. "Anyone got the water bottle?" cries a blonde woman in her 40s. "I need the bananas! Who has the bananas?" yells someone else. "No one ever has the bananas," one woman confides to me, looking downcast. "They're very rare." Everyone in earshot nods solemnly. Some people are armed with shopping bags brimming with the mini toys. Some have paper lists, and are frantically crossing off their new acquisitions. Everyone seems to have a forensic knowledge of their own inventories. "I just need the tomato sauce and I'll swap it for the eggs," says one man with the brisk efficiency of a Wall Street trader. A man in his 20s wearing a grey hoodie cases the queue, holding out a miniature Vicks VapoRub. "Tuna?" Spare tuna? Anyone want to swap this for the tuna?" he repeats. "You must really want that tuna," I say to him after his sixth lap of the line. 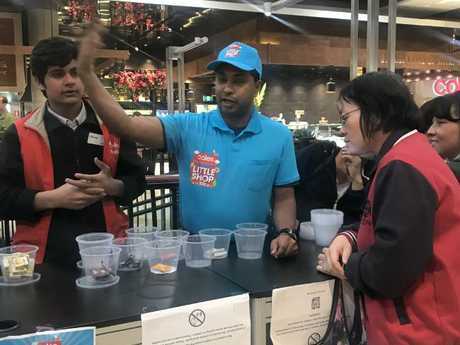 Flustered security guards are barking into headsets and trying to usher the crowds back into the queue but they're mostly unable to compete with the tidal wave of miniature market forces. 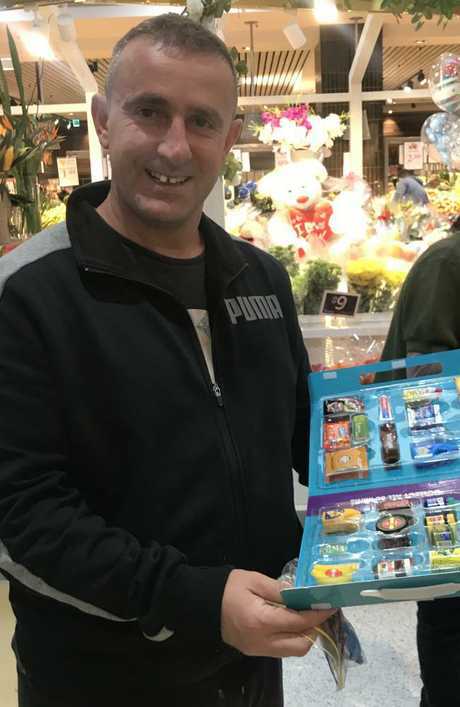 Frank from Drummoyne is holding a nearly-full set of minis in a carry case. 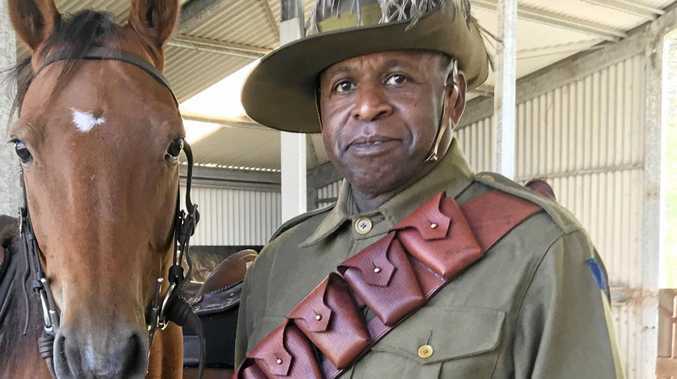 He's been sent along today by his son Jack who's playing AFL. "I'd rather be playing AFL too," Frank confesses. Meghna from Riverwood is here with her two kids Aarnisha, 19, and Aaryan, 12. Like many people, they're only missing the elusive bananas. Why do you like collecting these things, I ask the family. A pause. "I just like them," says 19-year-old Aarnisha. Some parents made signs to get the toys they want. Nine-year-old Katherine and her brother Theo, 5, from South Sydney are here with their mum. They seem to be attracting quite a crowd. "We have two full sets so we're just swapping the extras," their mum tells me. Two full sets means at least two bananas. No wonder this family are being mobbed like rock stars. 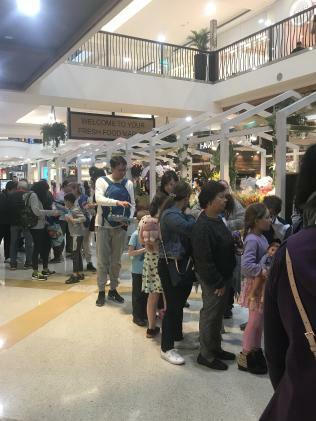 By 10:10AM the official swap has only been on for 10 minutes, and the queue has doubled, stretching practically half the length of the entire Westfield. 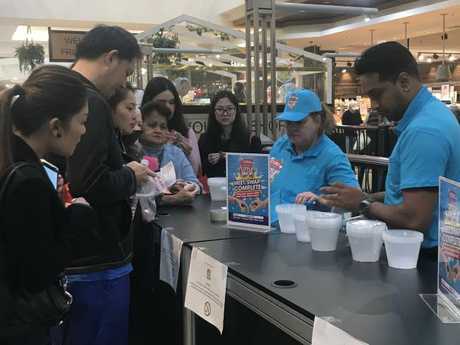 Crowds are now gathered around the official table but the Coles staff seem to be overstocked with the boring ones like the Lipton tea and the Huggies nappies. "Don't you have the bananas?" asks one woman crossly. The beleaguered staff member shakes his head. "You should say 'Yes we have no bananas'," I quip. He looks at me blankly. As early as 10:20AM the frenzy seems to be dissipating as everyone starts coming to terms with the fact that they've got everything they're likely to get. Meghna and her kids find me again in the crowd. They show me their carry case. It's full. "We got the bananas!" she says proudly. Crime Police have charged a man following last night's street brawl.